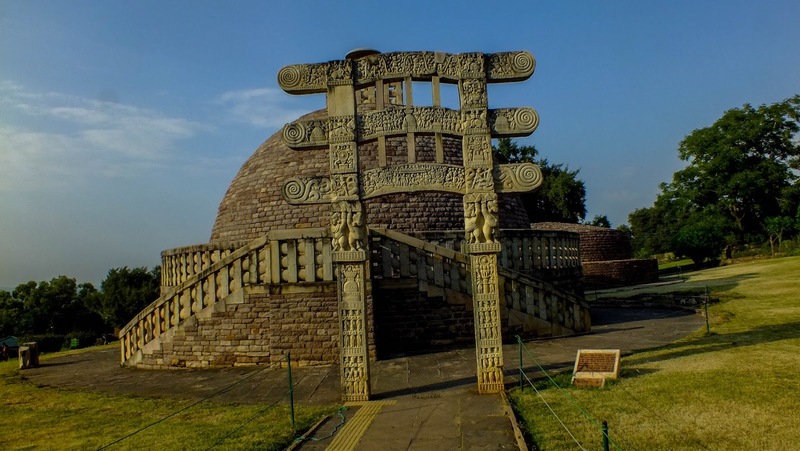 Sanchi needs no introduction - most of us remember it from our history books. However, I dont think Indian education system does justice to all these magnificent monuments left behind by kings long gone by. 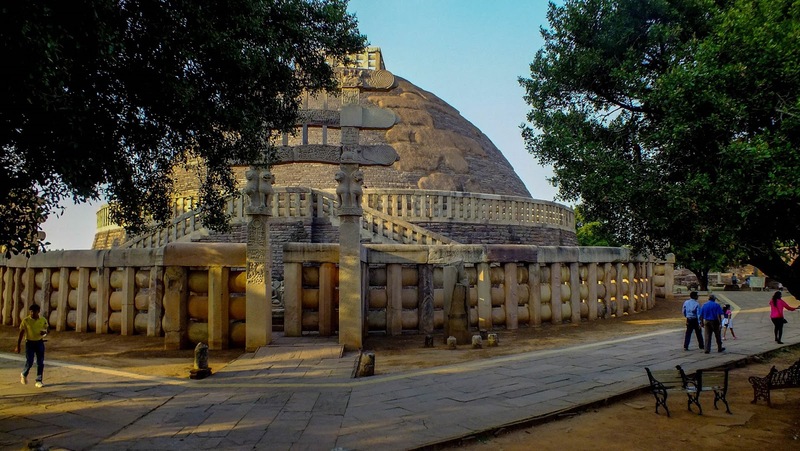 For example, the Sanchi Stupa is the sole surviving stupa built by Emperor Ashoka - and the oldest surviving stone structure in India (thank you wikipedia). Legend goes that after Buddha was cremated, his ashes were divided into 10 parts and they formed the core of 10 main stupas built by Emperor Ashoka. 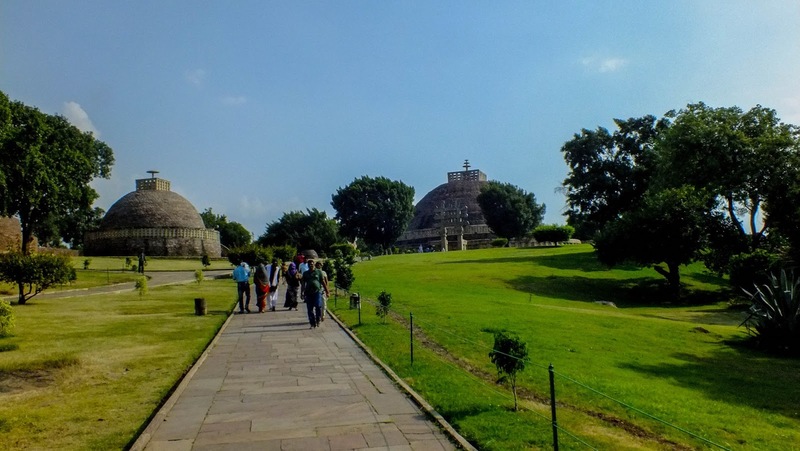 The location of 8 of them are lost, only two are known - Sanchi and Sarnath. The one at Sarnath has been rebuilt around 500 AD (by Gupta rulers probably), with only the basement surviving from Emperor Ashoka's stupa. 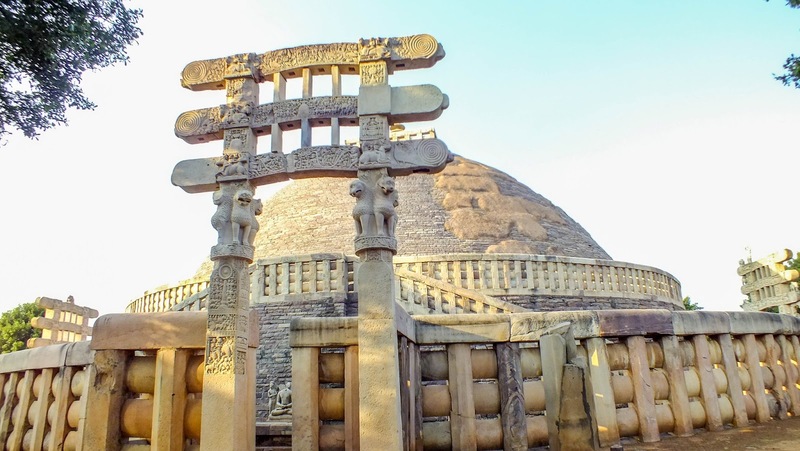 Sanchi had a more lucky existence, where the original brick stupa has been retained and covered with stone by the later Sunga rulers (enlarging it in the process). They also added the ballustrade and the stone pathway around the stupa. 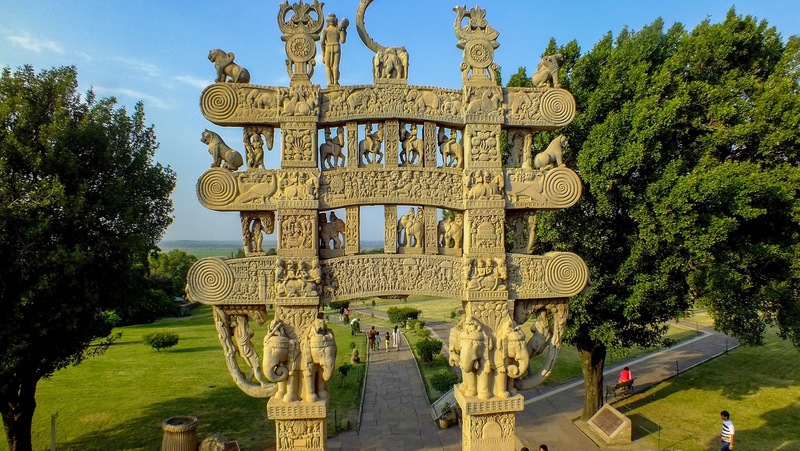 The Satavahanas, who succeeded the Sungas, added the 4 elaborated carved toranas (gateways) which give Sanchi its identity. But once you start walking the around the stupa, and guide explains how the original structure was built over and the 4 toranas were added later, that you start appreciating the amount of history squeezed into this small dome. The Sungas also built Stupa No.2, which is slightly smaller and has only 1 torana while Stupa No.3 was never finished. The guides helpfully point out that most of the stones on the walkway are actually donated by ordinary people – traders, craftsmen etc. And we can still see their names inscribed in Brahmi script, at the corners of the stones. 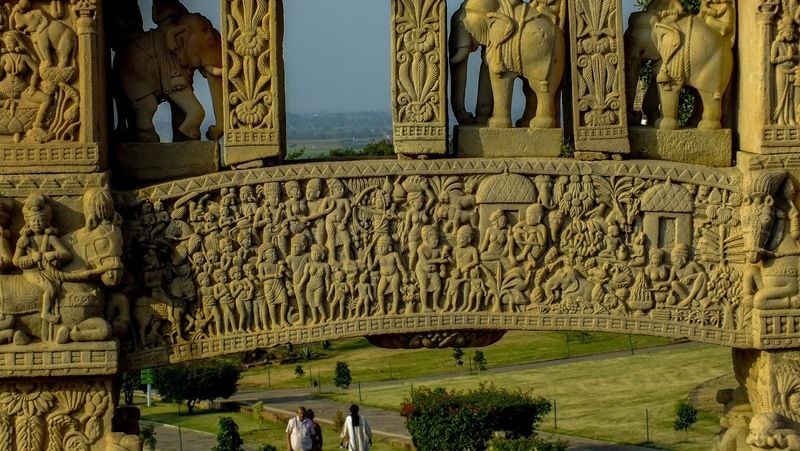 But if you carry away one memory from Sanchi, they are the toranas. Carved from head to toe with mythical yakshas, stories from Buddhas life and other intriguing forms like courtesans, the toranas are easily the best surviving example of Indian art more from BC era. The imagery, especially the stories about Buddha’s life, are still a beauty to behold, albeit a bit difficult to understand, unless you have a guide with you. Especially since Buddha is not represented in a human form ever – usually as a horse, lotus, footsteps or the bodhi tree. The stupa no.2 (above) is smaller, and with a single torana, doesn’t have the grandeur of the Great Stupa. Strewn on the grounds around the stupa are remains of mainly small brick stupas and temples. There is also the remains of a monastery a little distance from the stupa, along with a huge rock donation bowl where people left donations for the ascetics. The most intriguing among these small structures is the Ashokan pillar. Broken off at the base, only a foot of the original pillar juts out of the ground. The lion capital on top, is kept in the state museum in Bhopal. The remaining pillar is lying in three pieces under a small shed nearby. Apparently a local zamindar had taken the broken pillars for crushing sugarcane (pre-ASI days). But even after years of sugarcane duty, the luster and the smoothness of the stone pillar is undiminished. So are the Ashokan edicts on it! The craftsmen of the old were such masters – remember the pillar was made 2300 years ago.